From the Hancock County Courthouse, go west on Hwy 16 for 9.3 miles to the cemetery, which is on the left side of the highway, about 50 feet from the highway. It is currently in a small grove of trees on property that is behind a chain-link fence. 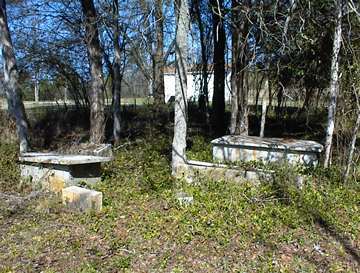 Cemetery is in need of restoration. "The dead in Christ shall rise first." "Lo! The prisoner is released, Lightened of her fleshly load, Where the weary are at rest, She is gatherd (sic) unto God." Grave not found in 2002. All info per Kimbrough list.